Father’s Day is around the corner, and the average person is gearing up to spend a whopping $133 on a gift for Dad, according to the National Retail Federation. This year, spending is expected to top $15.3 billion dollars in preparation for just one day! The most popular gifts are a “special outing” and gift cards. This beautiful, modern set is made with double-walled stainless steel that can keep your drinks hot or cool for hours. It features a customizable vegan leather sleeve that comes in a variety of colors and can be easily removed for cleaning. Packaged in a two-piece gold-tone gift box complete with a ribbon, this gift is sure to impress! This BBQ Set is a classic gift for Dads but with the extra spark of having a personalized case! The set includes a spatula, fork, and a pair of tongs. The case is made from sturdy aluminum and has an easy carry handle and double clasps to keep Dad’s new BBQ tools portable and secure. 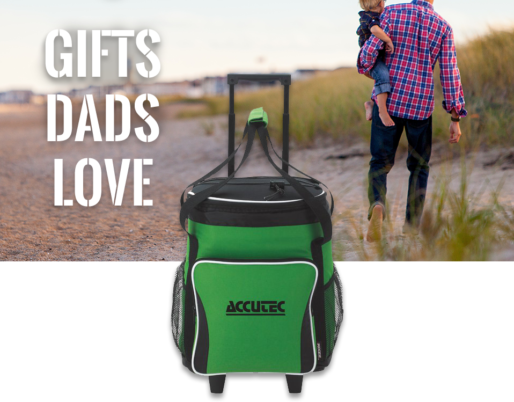 Perfect for tailgating, traveling, or camping, this cooler will definitely get your Father’s Day (or any other day) celebration rolling! You can personalize the front pocket to display any text or logo you desire, and it is available in three chic colors. The 30 Oz. Himalayan Tumbler is a great gift for all occasions. Crafted from stainless steel and vacuum insulated, it can keep your beverage hot or cold for up to 6 hours. A custom imprint will give this tumbler a polished look and the personalization it needs to be a truly special gift, whether it’s given on Father’s Day or not! Myron carries a variety of unique and standard promotional items for any and every brand. From pens to tech, calendars to bags, you can keep your brand at your customers fingertips with high quality, affordable promotional items from Myron.